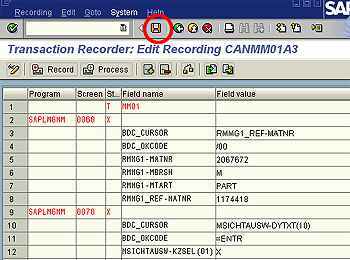 In SAP, SHDB transaction code allows a user to record keystrokes and other keyboard actions so that they may be incorporated into a BDC session. 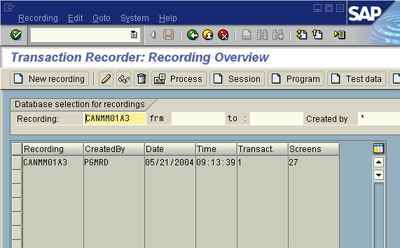 While any session may be recorded, it does not mean that the recording can be used to create a session.Within a recording individual screens may not be allowed.Customized screens may present a problem. Only use the non-customized screens to record sessions. 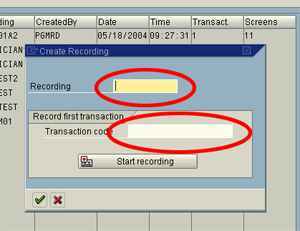 To start a new recording, enter a recording name (up to 10 letters) in the field labeled “Recording,” and the Transaction Code MM01. Click either the “Start Recording” button or the green check mark at the bottom of the screen. Once the Start Recording button is pressed, the system displays the screens for the transaction code requested. Enter each field needed for the transaction, and proceed to the following screen. 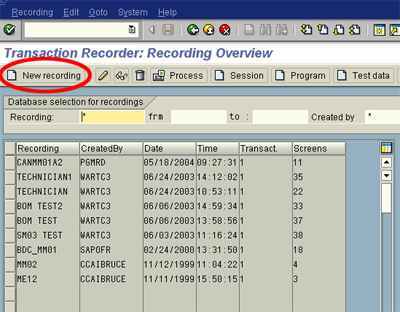 A “recording running” message may appear between screens. During a recorded session screen interaction time is extended.